YOURS CHLOE: Nails | Topshop Matte Nails "Dress Up"
Nails | Topshop Matte Nails "Dress Up"
One of my favourite things about the autumn/winter months is the return of deeper nail colours. Don't get me wrong, I adore the lovely pastel colours of summer but I've always been more of a fan of the darker hues. So far this season I've been loving a wide range of brands but the Topshop nail polish range does hold a special place in my heart. Hands up who wants a manicure that lasts for days? Well, I've always found that all of the Topshop nails range fits the bill perfectly, without breaking the bank. As always with Topshop, the quality of this polish is rather fab. I find you only really need two coats to achieve a stunning colour, and it doesn't take forever and a day to dry. The one drawback is it's not as matte as you'd maybe expect for a matte polish, but I love it all the same. What's you go-to autumnal nail colour? 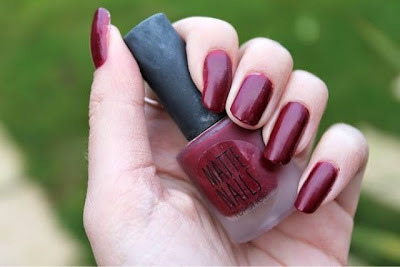 This colour looks absolutely gorgeous however I'm not a fan of matte shades. Does it look glossy if you use a high shine top coat over the top? that's such a pretty colour! !